Look, I know LGBT issues can be a sensitive topic for some people, and I totally respect that. I’m pro-LGBT all the way, and as a straight male, I’m probably in no position to comment on this or really stomp my feet about this issue. I just think it’s worth mentioning. In case nobody else on the Internet picks up on this and says something, I just want to put this out there for everybody to see. The last time we saw Rictor and Shatterstar in an X-Men comic, they came out as a gay couple in the pages of X-Factor. Their first kiss back in 2009 was the first ever on-panel male-to-male kiss in the pages of Marvel Comics. It was a big deal. Then X-Factor came to an end in 2013 and I don’t think we’ve seen either of them since. 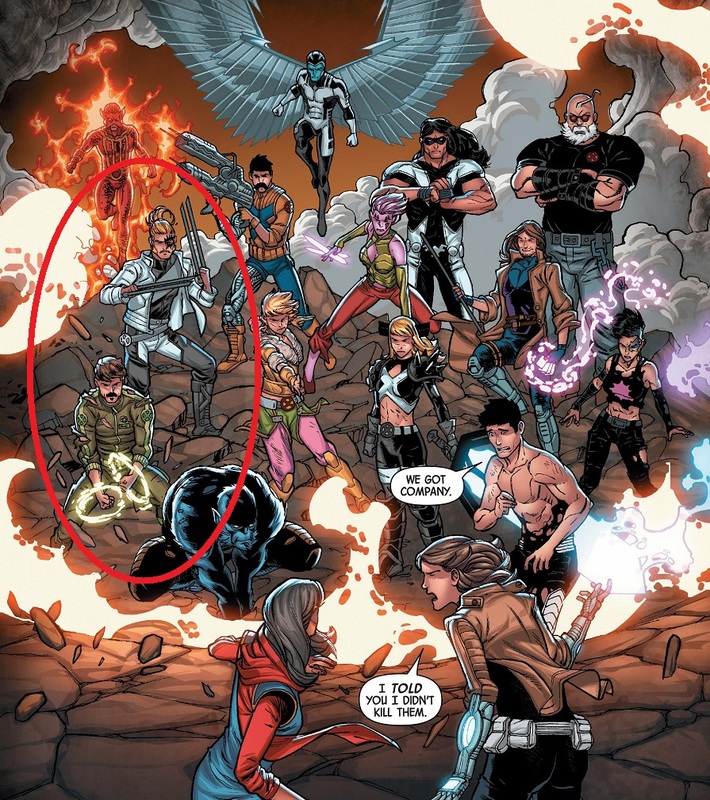 Rictor and Shatterstar disappeared into the same comic book limbo that claims most B and C-list mutants. And then both of them show up on the final page. You’re going to have zoom in for this one, but it’s as plain as that mustache on both of their faces. Look, anybody and everybody is more than welcome to have whatever kind of facial hair they want. But you cannot tell me that those are not stereotypical big gay mustaches. Those are clearly Freddie Mercury mustaches. I’m not making any judgement calls here. 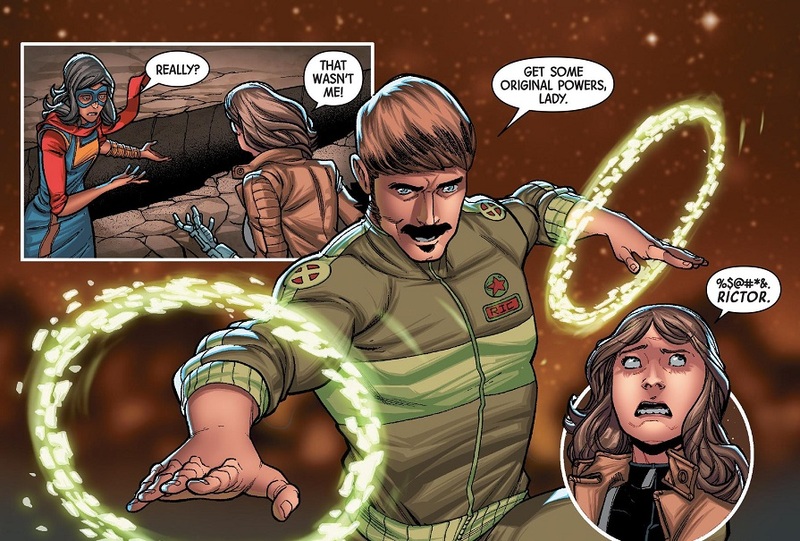 I’m just throwing it out there that I think it’s a little weird that when two of Marvel Comics’ most popular openly gay men make their long-awaited return to comics, they’re both sporting stereotypically gay facial hair. Someone somewhere clearly made that active decision. Also, while we’re here, the Strong Guy Watch continues! Strong Guy also shows up in Secret Warriors #3, and he is still as silent as the grave. He appears in several panels, beyond just this big team shot, but he doesn’t say a word. It’s like whatever edict is putting Strong Guy in these comics also states that he must not utter a word. This is fascinatingly weird. Also, oddly enough, that was totally Strong Guy reacting when Rictor and Shatterstar had their first kiss! Comics are cyclical! Posted on June 15, 2017, in Comics, Marvel, X-Men and tagged Rictor, Secret Warriors, Shatterstar, Strong Guy. Bookmark the permalink. 5 Comments. I haven’t read this issue yet, but Strong Guy has a speaking role in Secret Empire United #1. Boom Boom and Magik are with him, similar to Secret Warriors. No way! That blows my whole dang theory out of order! Thanks for letting me know. I’m not really reading any of this stuff, but I don’t wanna miss Strong Guy appearances! Does everyone from X-Factor have facial hair now? Does Polaris have a goatee? Readers need to know!